Jeremy Scott is arguably the biggest entertainer in the world of high fashion. This time he took his party full of high-profile guests and fun clothes to NYFW. The designer showed his Spring 2019 Collection with a lot of celebrity buzz, as usual. 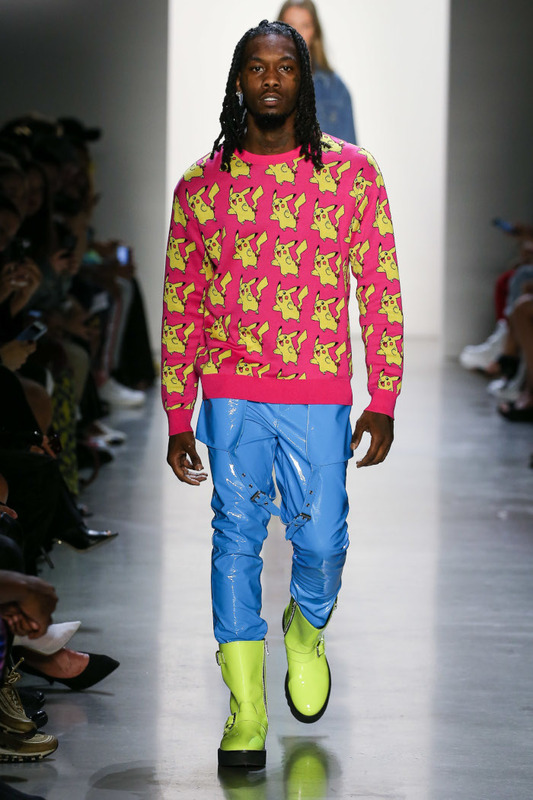 Rapper Offset of Migos got into the role of a model, donning one of the most vibrant Jeremy Scott designs. 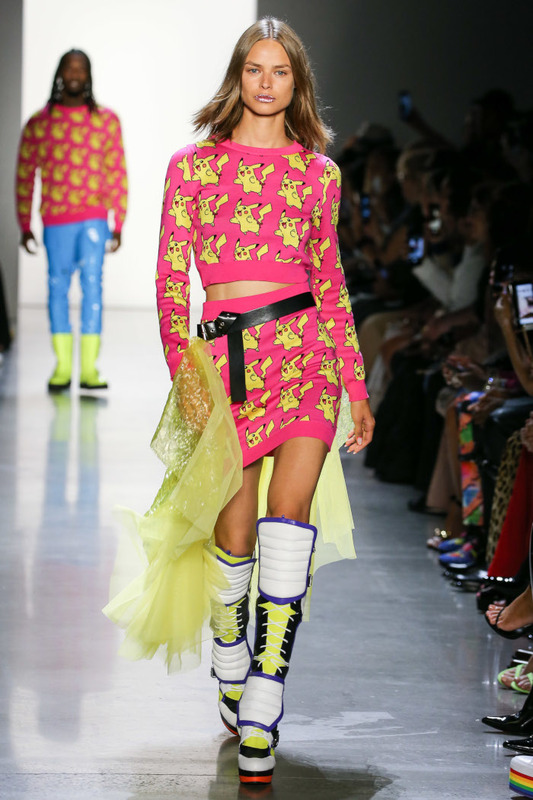 He paraded down the runway wearing a hot pink sweater with Pikachu all over it and neon blue latex pants. As if that wasn’t enough the designer dressed the rapper in acid green boots. Proud wifey, chart-topping Cardi B was watching her boo from the front row. Just last year her stylist had a hard time to convince designers to borrow her pieces, and now she is ruling the FROW game. The day before she was sitting just a few sits away from Anna Wintour at Tom Ford‘s Spring 2019 show. The Jeremy Scott Spring 2019 Collection is the designer’s possibly most personal so far. 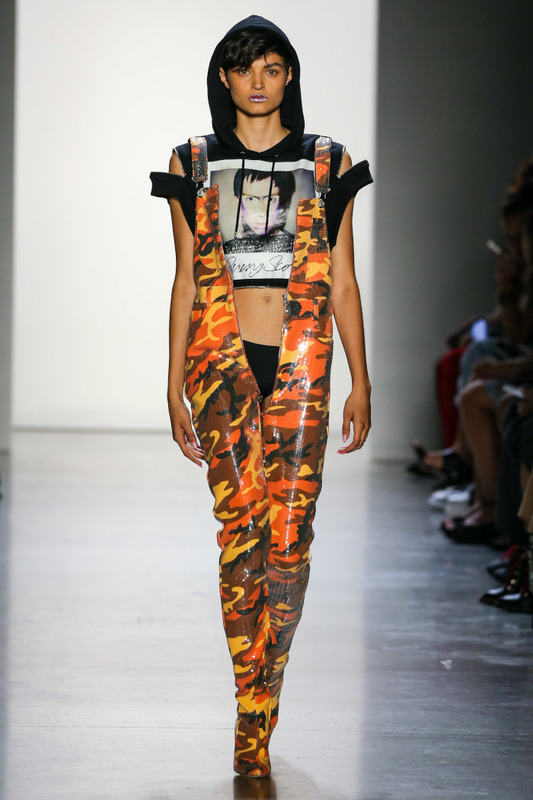 Unexpectedly, this time his muse was teenage Jeremy Scott. Instead of looking around for inspiration, for this collection, Jeremy Scott recalled his experimental style from years back. It wasn’t really hard for the designer to remember the exact pieces he wore back in the day. 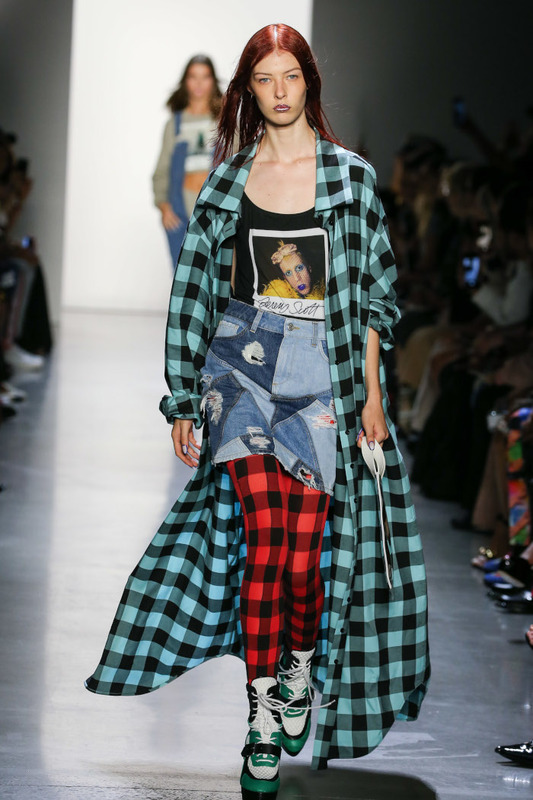 Jeremy Scott never throws anything away! When he was 13, he got rid of a shirt he didn’t like. Only a week after he regretted his choice. The 13-year-old Jeremy decided to keep everything just in case ever since. If I’ve worn it, it’s in a box somewhere,” he claims. You know how trends come and go and come back. You could really use a lot of pieces from your ’80s and ’90s wardrobe right now. For Jeremy as a designer, it’s probably not solely about the trends – each piece has an emotional value. His latest offerings really channeled the edgy, rebellious, experimental young Scott. 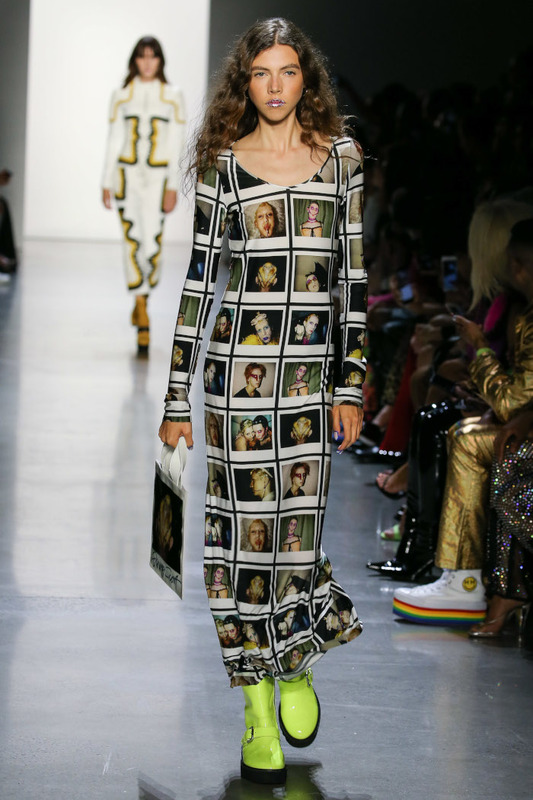 He even used polaroids of his young self as prints for the Spring 2019 collection. Besides the ’90s references and elements inspired by a trip down a memory lane, the collection doesn’t have a nostalgic feel. It’s as vibrant, fun, and colorful as always! And again, these pieces are 100% adult with a lot of childish charm. 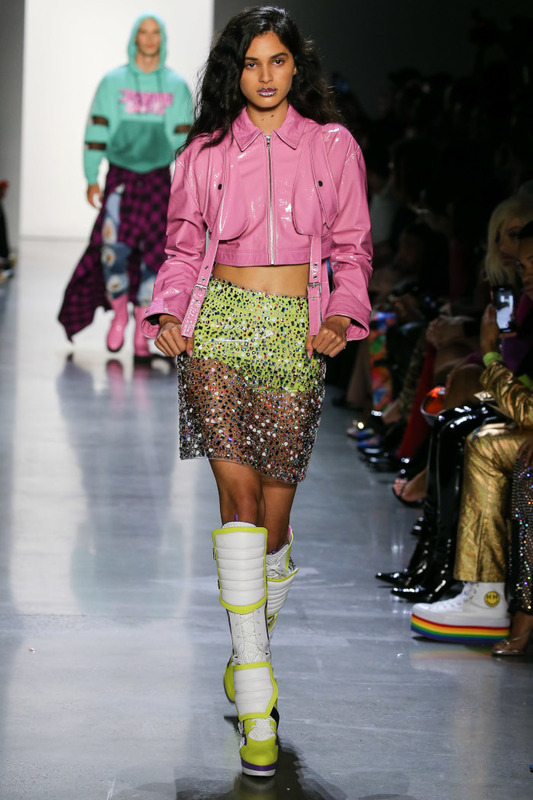 The stars of the Jeremy Scott 2019 show were the “over-the-shoulder-boots.” His celebrity clientele will for sure go crazy over these! If you aren’t as experimental, there are plenty of other vibrant choices made for the spotlight.